The Academy of Interactive Arts and Sciences held their third annual Interactive Achievement Awards last Thursday, May 11, 2000 in LA. In the midst of E3, the IAAs have gained some notoriety, and with good reason. It was an all-star event, featuring Martin Short as emcee, and with celebrity guest presenters like Ahmet Zappa, Peter Molyneux, Sid Meier, and Harry Shearer. Of course, some of the winners were luminaries in their own right like Bruce Shelley, Hironobu Sakaguchi, and Will Wright. In all, it was a great evening, and some of the greatest games from the last year were given their proper recognition. Of course, there were some disappointments (Knockout Kings over Tony Hawks Pro Skater?!?). Weve summed it all up below for your viewing pleasure. Hironobu Sakaguchi, President of Square USA, and creator of the Final Fantasy Series was honored with the Academys Hall of Fame Award. 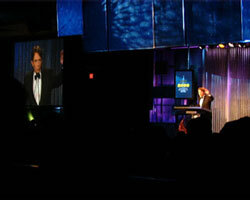 He was presented with the award by Sid Meier, last years recipient. The Game of the Year Award went to The Sims, and was accepted by creator, Will Wright. The remaining awards were distributed in four categories: The Craft Awards, Console, Online, and Personal Computer.